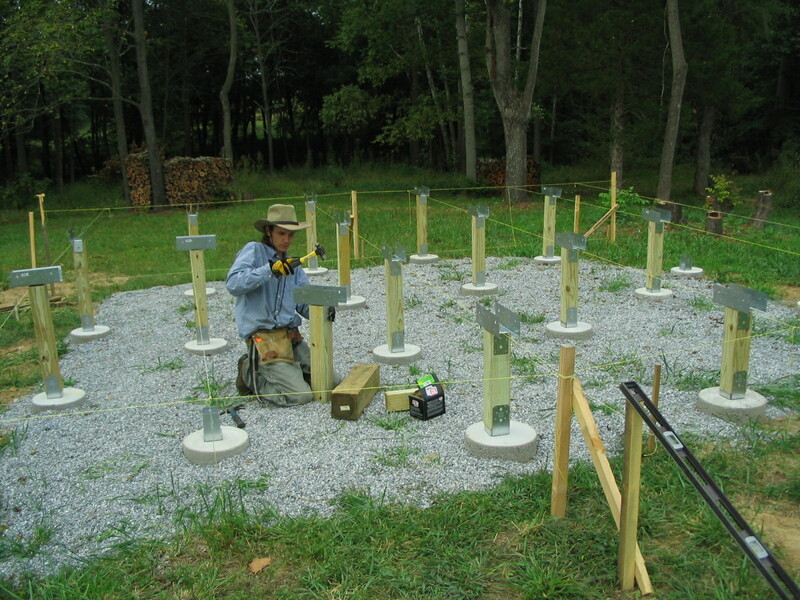 The posts had to be cut to all different lengths to create a level surface since the concrete piers follow the contour of the ground. 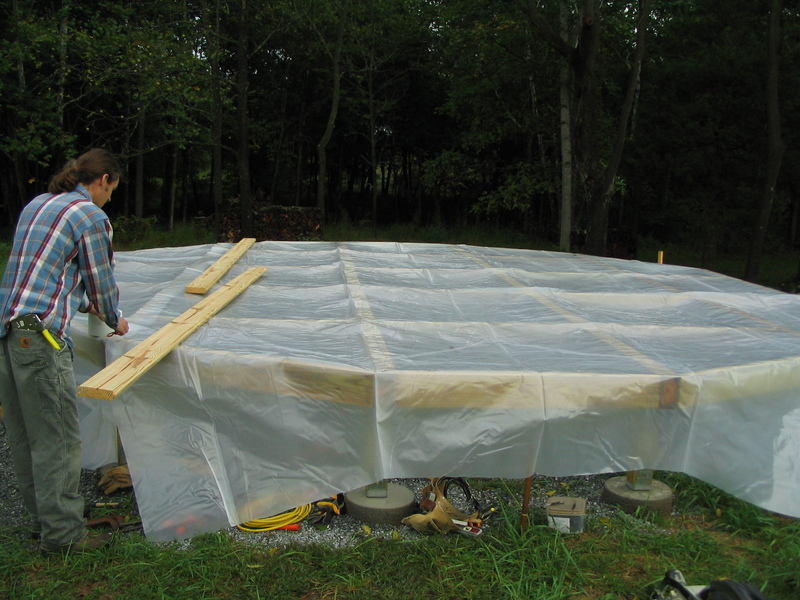 We put down a layer of 10 mil plastic sheeting to act as a vapor barrier. 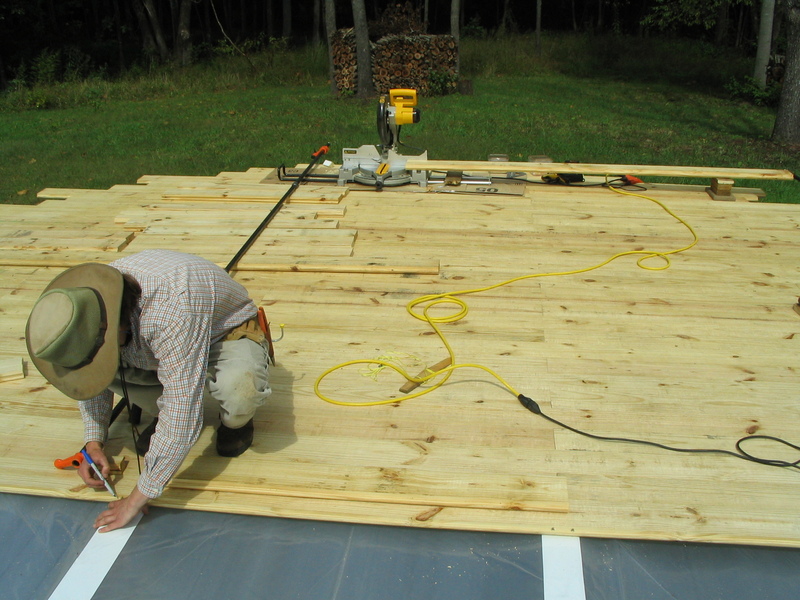 We chose to use 2 x 6 pine tongue and groove decking boards for the finish floor. 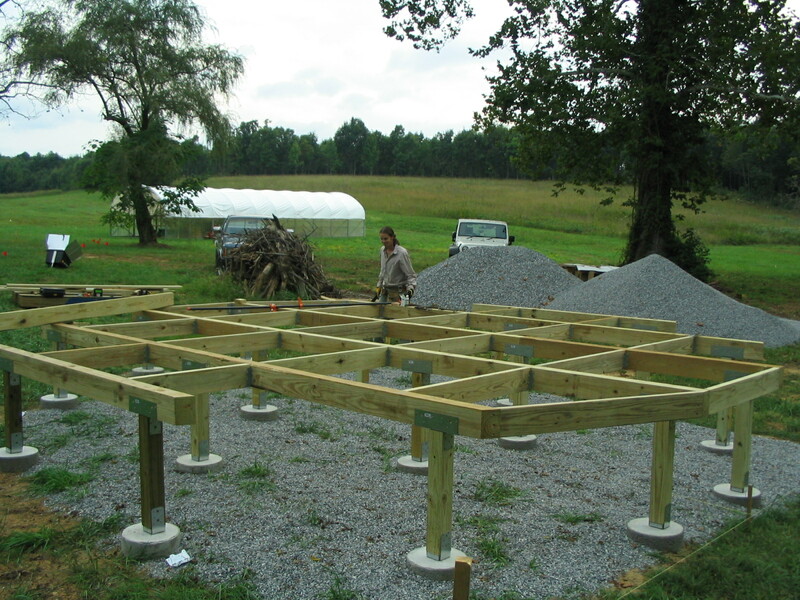 Since they are so thick they can span the 4′ distance between the girders without having to use additional framing members or a plywood subfloor. 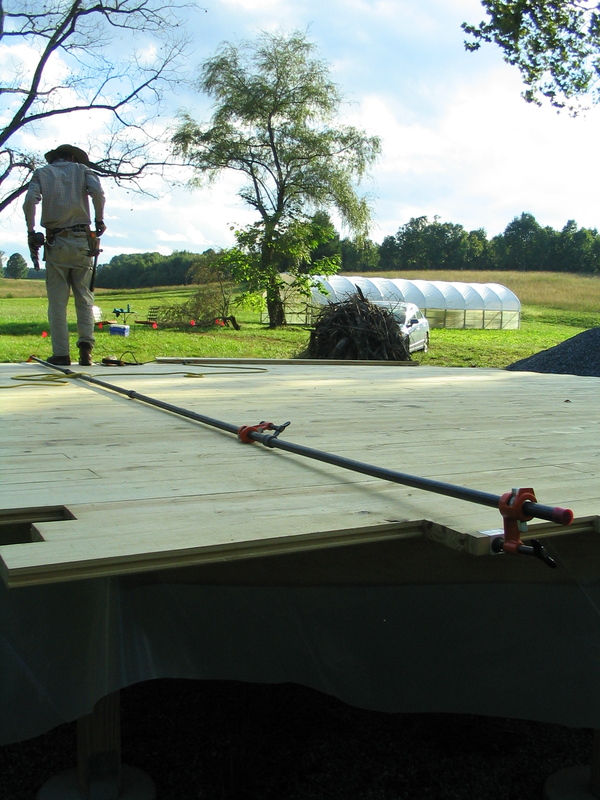 We used clamps to pull the boards together, and every course Gavin screwed the boards into the framing. 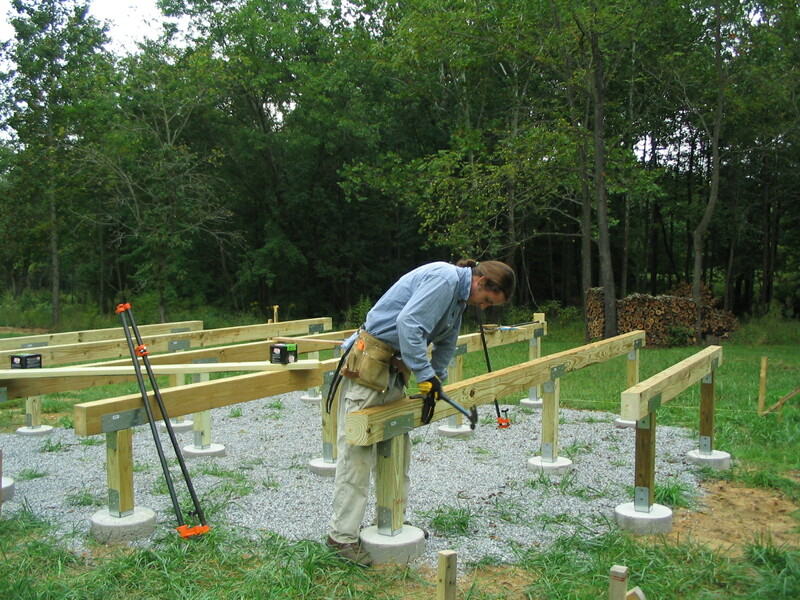 By the end of the first day we had laid about half of the decking boards. By the end of the second day our bar clamp had many extensions! 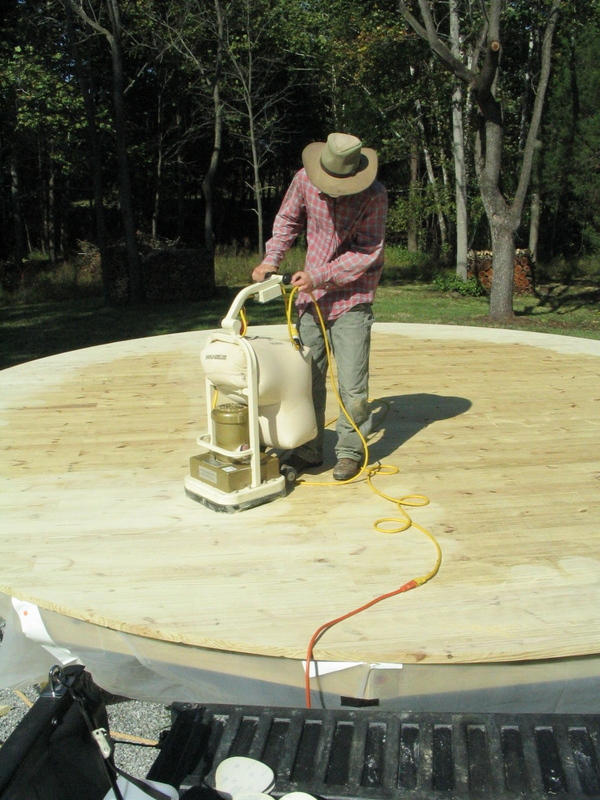 I was gone when Gavin scribed the circle with a circular saw. 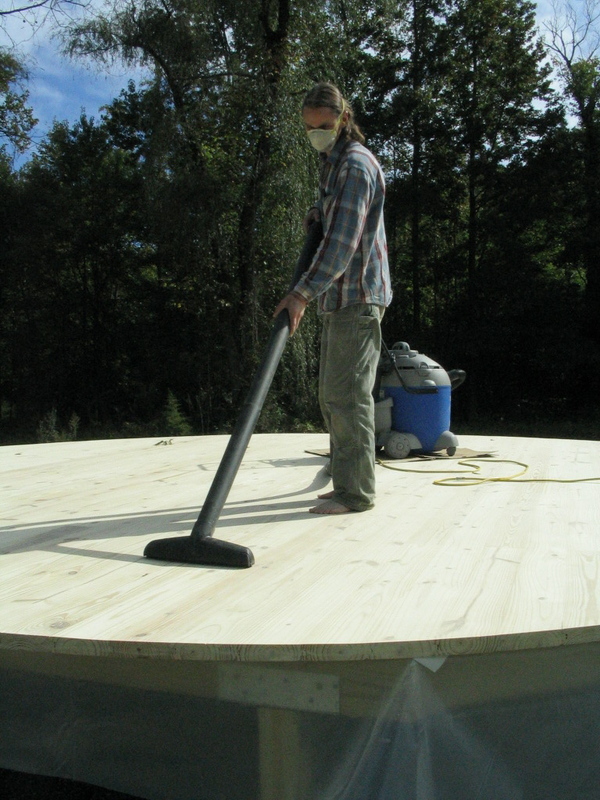 Here he is using a rented sander. It’s starting to look like something! 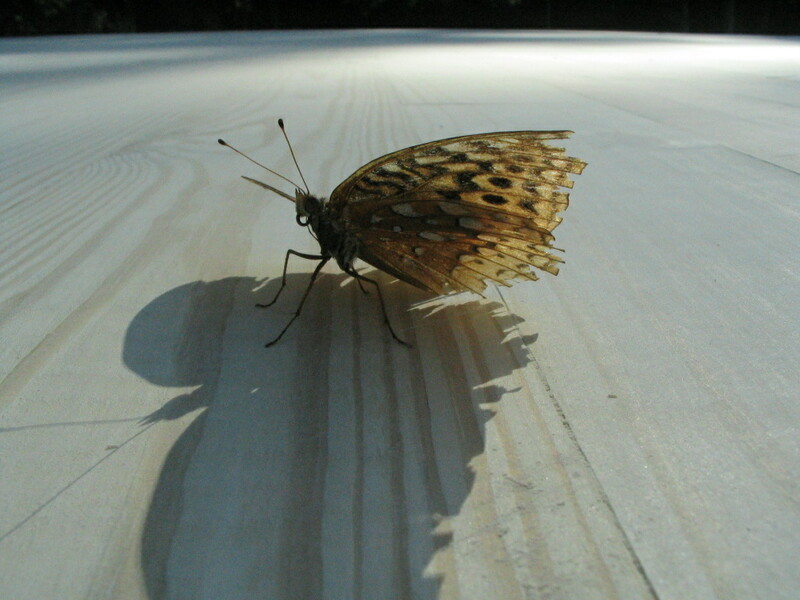 We had a visitor to the newly-sanded circle. 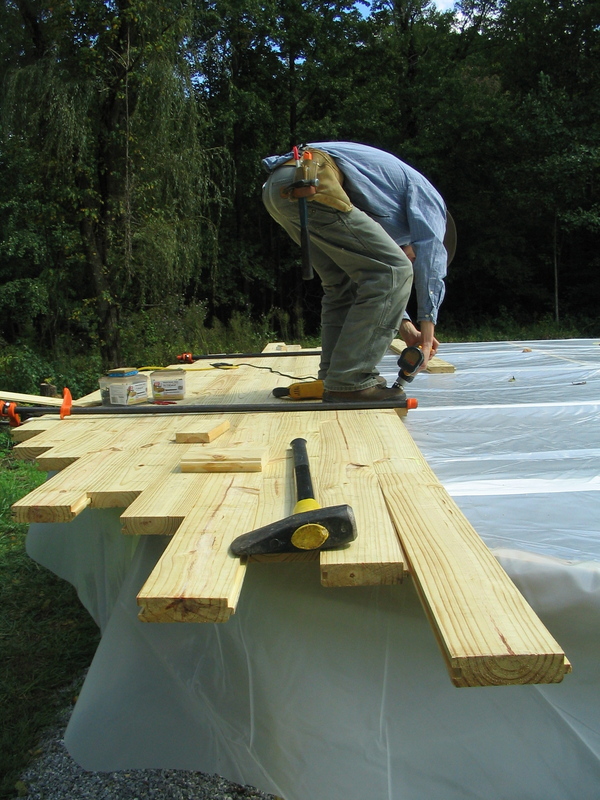 We stapled up the vapor barrier to the edge of the decking boards. Then we used Rubio Monocoat, a zero VOC oil, to finish the edge. 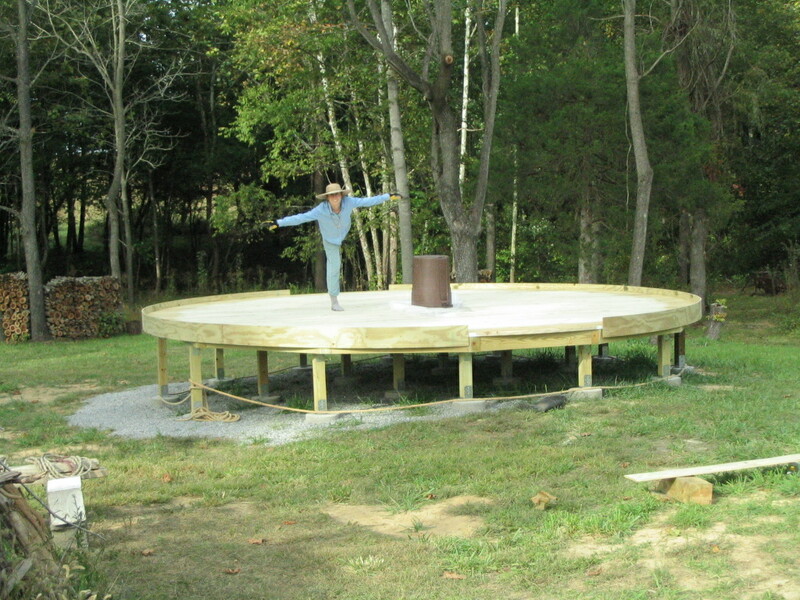 The edge needed to be finished before we could put up the yurt because it would be very difficult to do afterward. 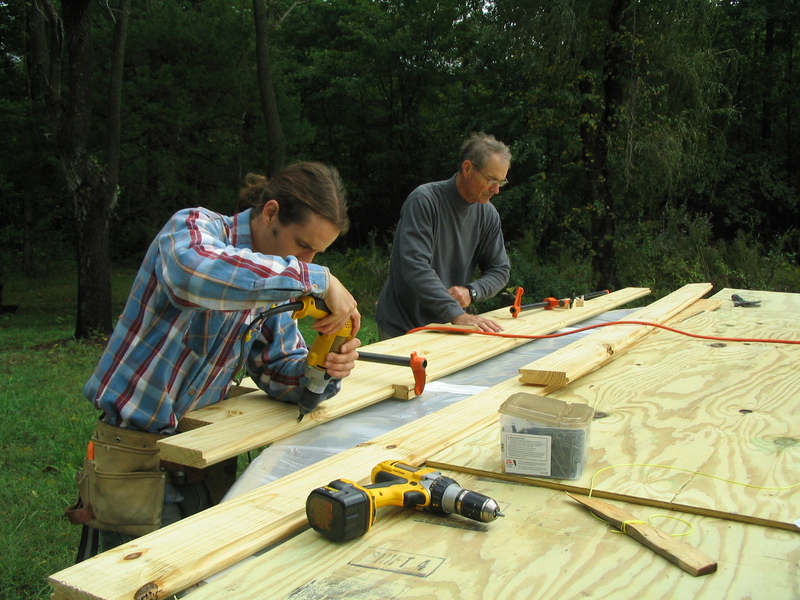 The last step was to cut some plywood into 6″ strips and screw them into the edge of the deck. 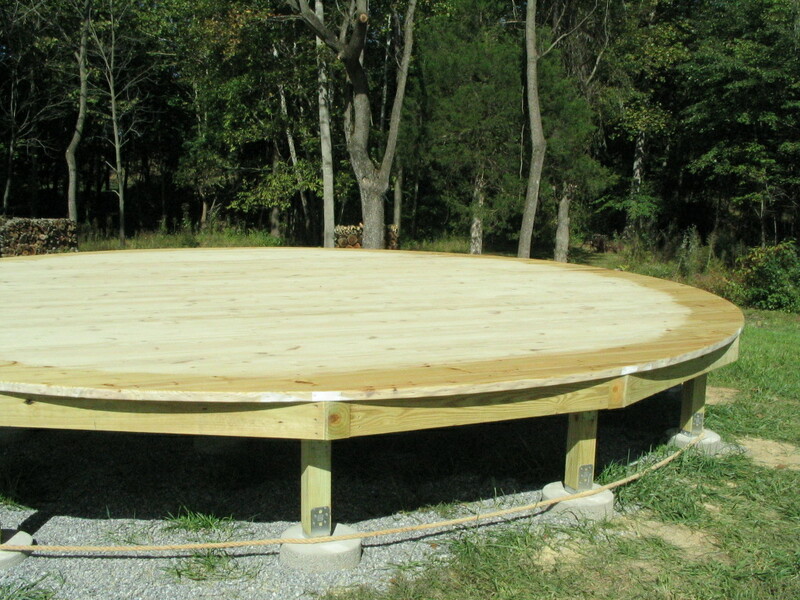 This is the bender board, which holds the lattice walls of the yurt in place. You can see the gaps left in the bender board for the two doors. 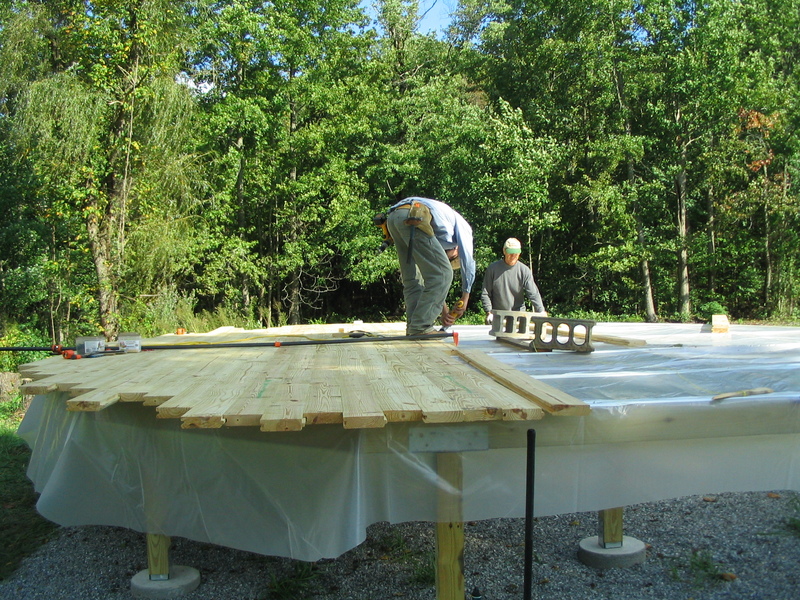 Then we draped plastic over the entire thing and got ready for the yurt raising!